Installing and maintaining green infrastructure is not without its challenges. 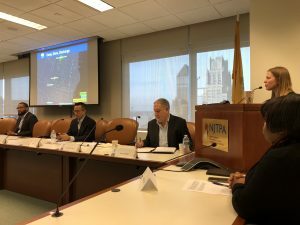 Workshop attendees learned how key challenges have been addressed - and barriers have been overcome - in real projects throughout the NJTPA and broader region. The below content originally appeared on CivicStory’s blog. If – like me – you don’t know the meaning of the word “bioswale,” then we’re in the company of legions of average citizens who might walk by bioswales every day without appreciating how really useful they can be. A bioswale, similar to a rain garden, is a landscape element designed to soak up stormwater runoff and remove pollution. In other words, a bioswale is one of several new tools deployed by green infrastructure engineers to mitigate the effects of stormwater overflows in our cities. And so bioswales — along with rain gardens, tree trenches, v egetated bumpouts, and sub-surface storage — are tools that today’s “green” urban planners use to relieve routine stormwater flooding that comes from the increased intensity of our rainstorms. 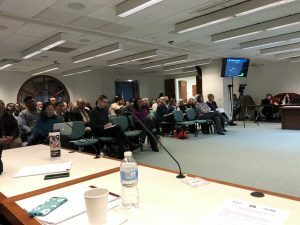 Several green infrastructure project leaders presented their case studies at a recent conference on “Green Infrastructure and Transportation”, hosted by the North Jersey Transportation Planning Authority (NJTPA) in Newark, and co-organized by Together North Jersey and Jersey Water Works. No matter whether it’s the single square mile of Hoboken, or the five sprawling boroughs of New York, each planner described undertaking a painstaking block-by-block assessment of how to correct the legacy “grey infrastructure” of pipes, pumps and ditches, which is how most cities have managed stormwater runoff for as long as anyone can remember. There will likely be an increase in funding too. Last month the NJ legislature voted to allow municipalities to set up stormwater utilities, to be funded in part by fees imposed on parking lots and other impervious ground installations. As of this writing, that legislation (S-1073) is awaiting the governor’s signature. Philadelphia’s strategy for reaching its 25-year green infrastructure goals is a combination of new stormwater regulations, incentivized retrofits and public retrofits. The most ambitious project now underway involves the plan to green two miles of a former industrial corridor along American Street, just north of Center City, to be completed by 2020. Hoboken, a flood-prone town which has been suffering an average of four combined sewer overflows a month, is putting in place green infrastructure solutions designed to reduce that frequency to no more than four times a year. The Hoboken 2017 Green Plan includes using “parks as defense”, decreasing impervious surfaces, and generally including climate adaptation in all future planning.